Sometimes smallest of changes in the routine can create major impacts. 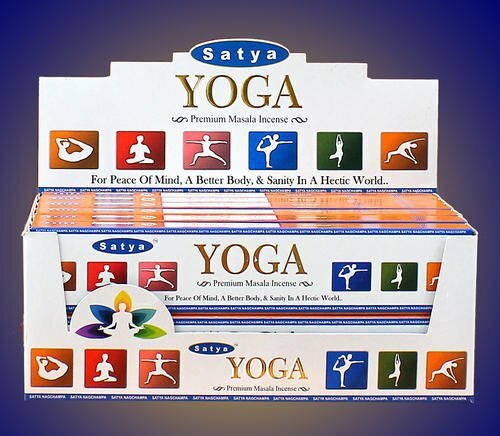 Just like burning these hand rolled satya yoga premium masala incense sticks would do for you. These incense sticks are hand rolled to provide you the fine long lasting fragrance for up to 45 minutes. The process of making handmade agarbatti includes preparation of dough by mixing extremely perfumed natural ingredients into a paste mode and hand rolling it bamboo sticks by hand. This is further added with the masala mix. To offer you natural product, natural extracts are used in the preparation and no animal fats are used in the production. This peculiar way of preparation, makes the incense sticks long burning. These premium hand rolled agarbatti is popularly used as a room freshener and for meditation practice. Lighting of agarbatti diffuses ecstatic aroma and is said to eliminate stress and uplift mood. These incense sticks can even lower down anxiety levels and improve your sleep quality. The pack includes 12 boxes of incense sticks. The incense sticks are of standard size and can conveniently fit in any incense stick holder. Include lighting of incense sticks in your routine to bring positive vibes and relaxing atmosphere in your home, yoga studio or office. If you have any questions about this product by Satya, contact us by completing and submitting the form below. If you are looking for a specif part number, please include it with your message.